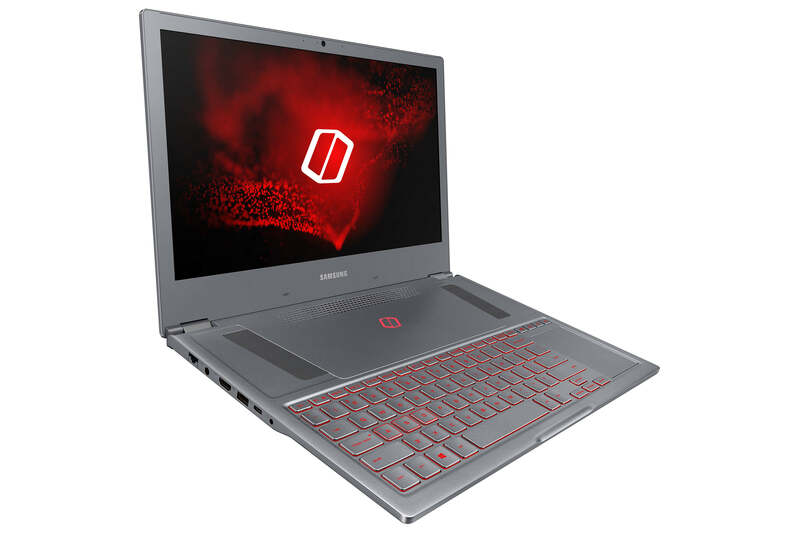 Designed with thermals and aesthetics in mind, Samsung has unveiled the Odyssey Z thin and light laptop. Despite being a lot less chunky compared to traditional gaming machines, high-end hardware is found throughout. An 8th generation Intel Core i7 processor with 6 cores and 12 threads will offer best-in-class performance. A GeForce GTX 1060 Max-P graphics card will provide 10 percent more performance compared to a 1060 Max-Q. Up to 16GB of 2,400 MHz DDR4 memory will be more than sufficient for gaming. In the storage department, the Odyssey Z can be equipped with up to 1TB of solid state storage with an NVMe PCIe drive. Measuring in at 14.8 x 10 x 0.7 inches, the Odyssey Z requires innovative cooling solutions to prevent overheating and excessive noise. A vapor chamber covers both the CPU and GPU and is complemented with fans to expel hot air out of the side and top vents. Fan noise is able to be kept to 22 decibels with little impact on performance when a silent mode is enabled. Standard I/O includes one USB-C, two USB 3.0, one USB 2.0, an HDMI port, headphone and mic combo jack, a gigabit ethernet port, and a DC barrel plug for charging. A 180W power adapter is included for charging the 54Wh battery, offering plenty of juice for intense gaming sessions. The Odyssey Z will become available in select countries including China and Korea beginning in April. United States consumers will be able to purchase Samsung's latest gaming laptop starting in Q3 2018.